We decided to flee the ugly political discussions and cold weather for a bit. 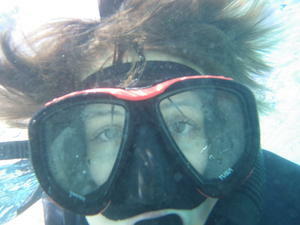 Actually, we thought we'd reprise a trip from 2001. 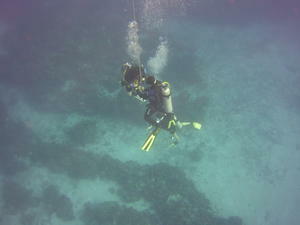 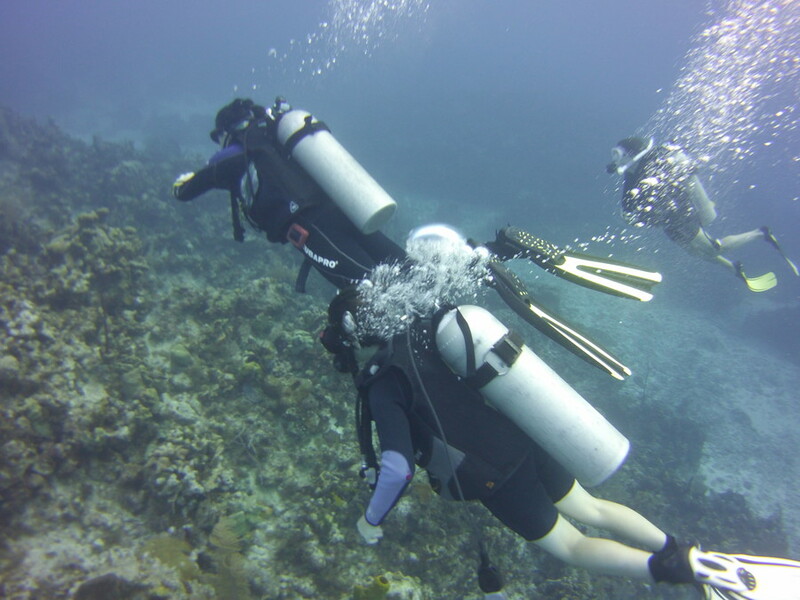 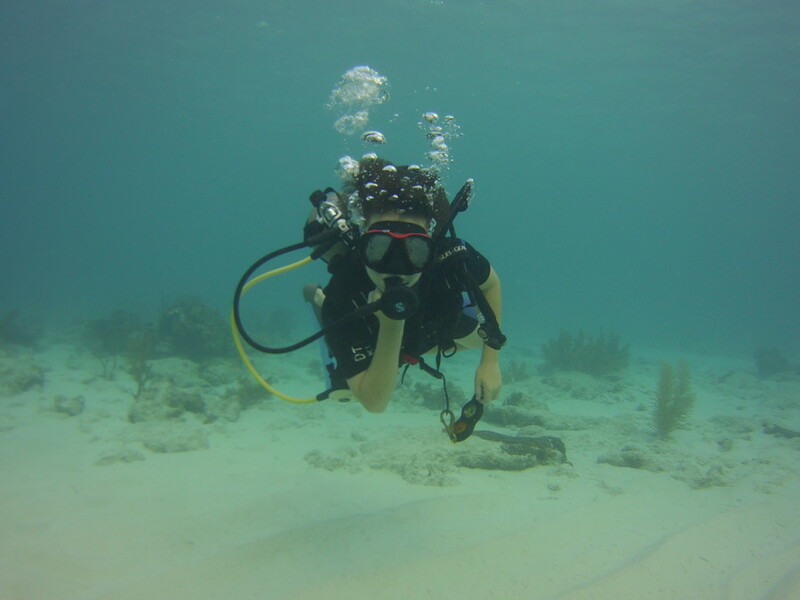 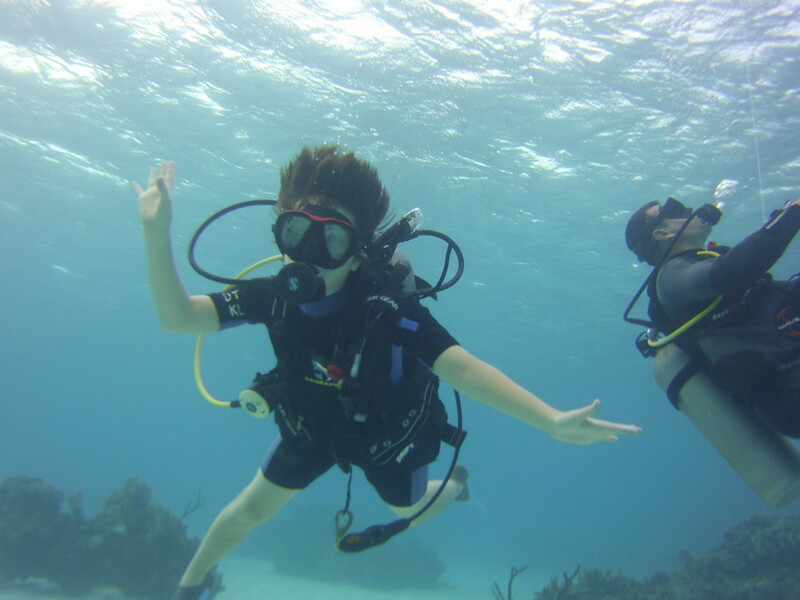 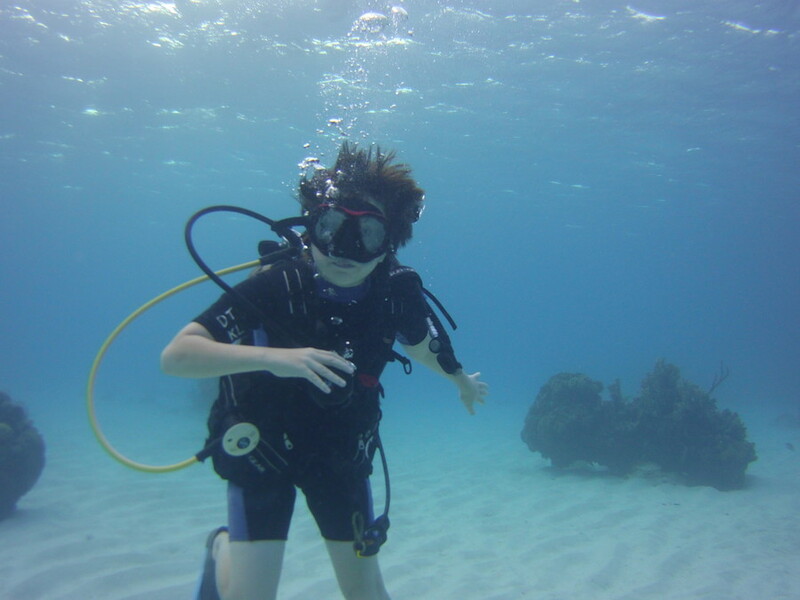 Robert was game and spent a couple weeks studying PADI online SCUBA lessons. As we approached our trip date, he signed up for his required pool sessions. 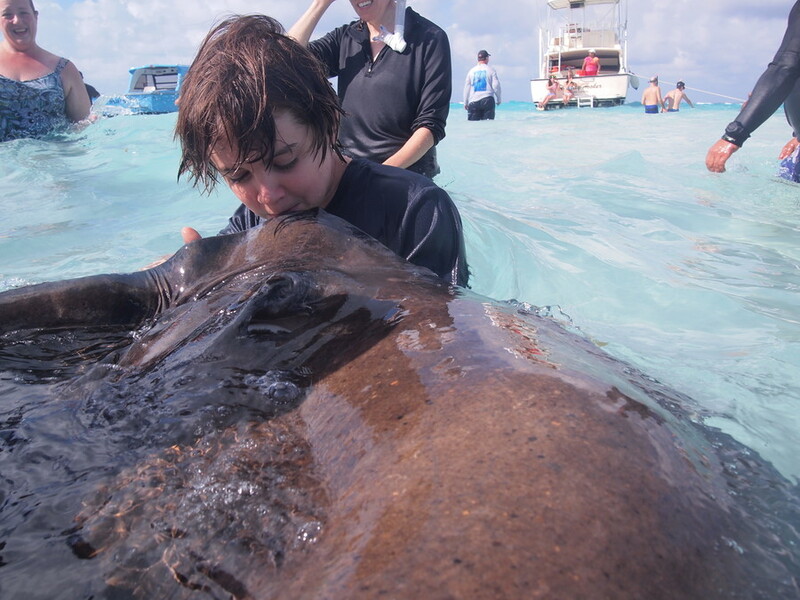 Unfortunately, he was stuffed up and unable to clear his ears in the pool. As you'll see, that did not slow him down. 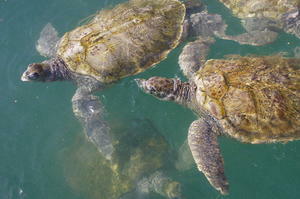 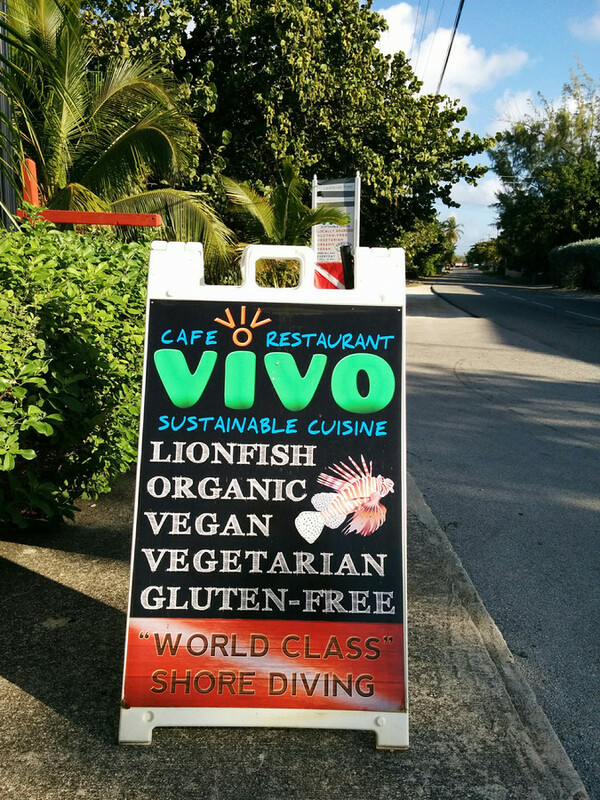 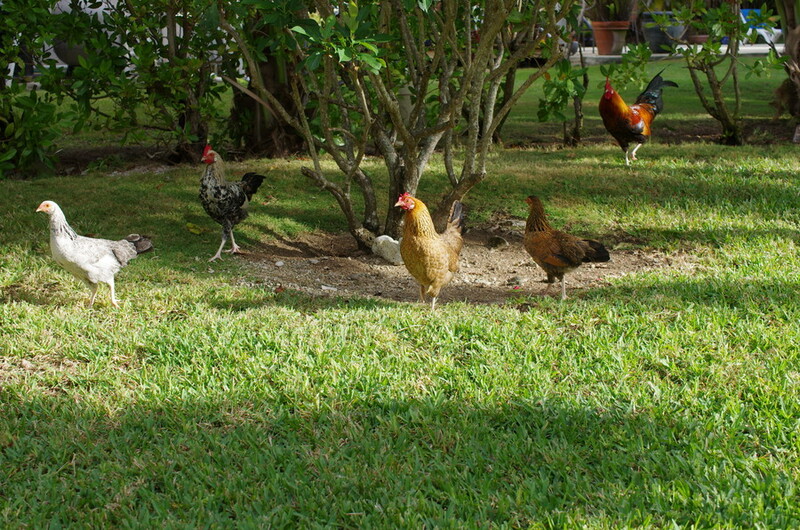 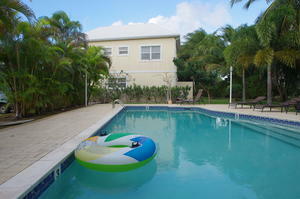 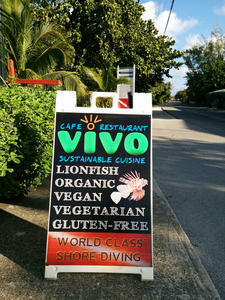 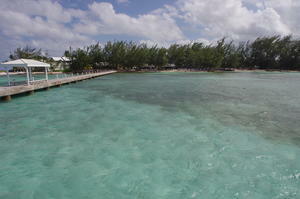 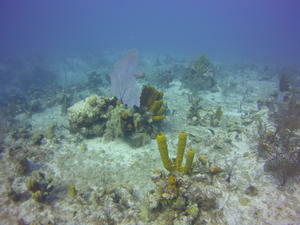 We flew down to Grand Cayman Monday the 19th and found our condo just about dinner time. 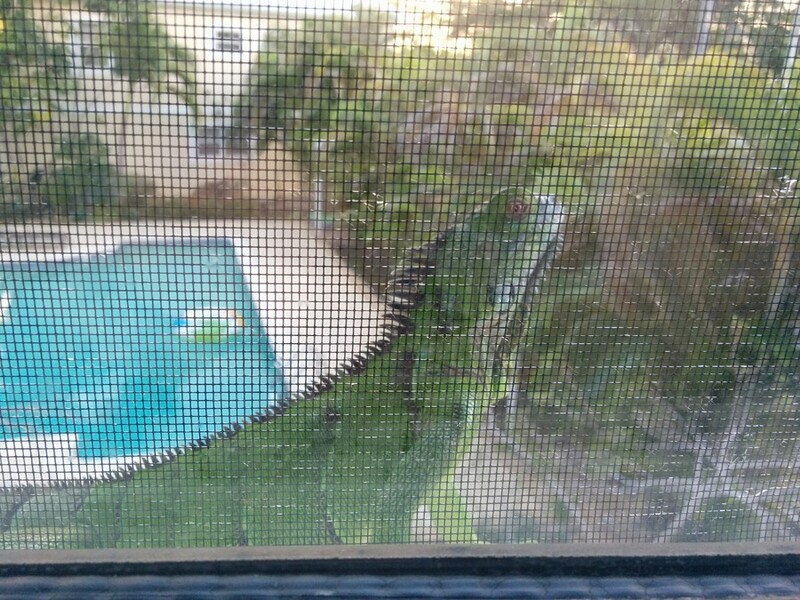 The next day, we were visited by Ivan. 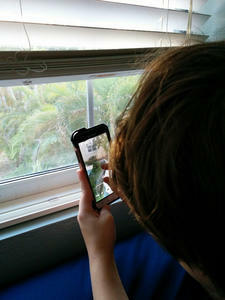 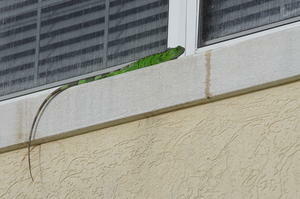 If you look closely at the photo above, you'll see Ivan Ivanovich the Iguana hanging out on our window sill. He liked the sunny side of the building. 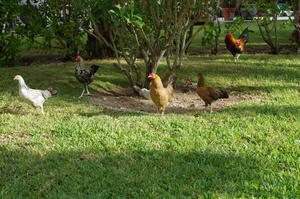 Ivan seemed to get along fine with the neighbor's chickens. Or maybe that was part of reason he liked the upstairs window. After introducing ourselves to Ivan (and having a bit of a relaxed, vacation breakfast), we decided to make sure Hell was not freezing over. 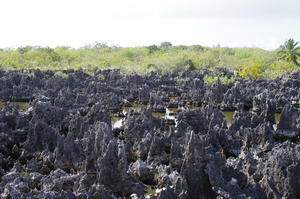 Hell is an odd spot in Cayman; you can read about it on Wikipedia. 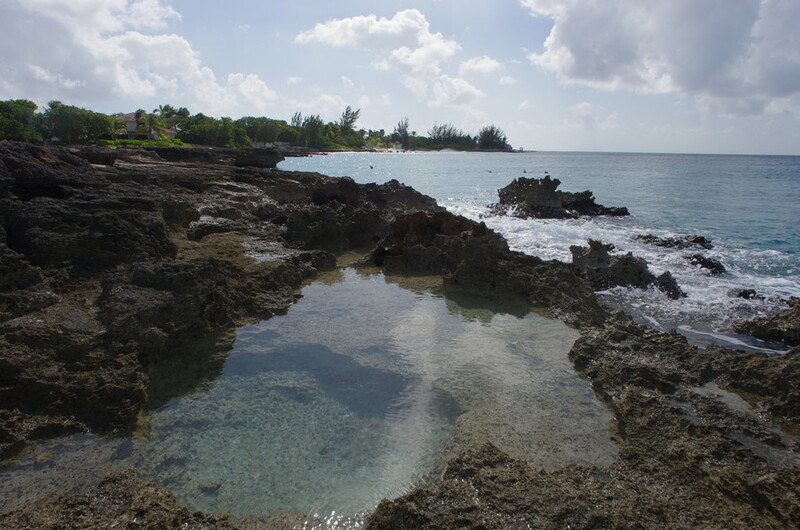 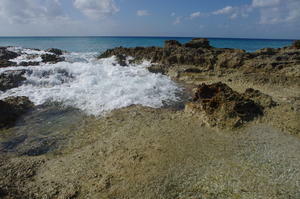 From my perspective, it's ironshore (hard, sharp limestone that breaks up Cayman's beaches) but inland. 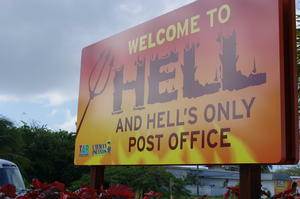 We were close by and so we felt obligated to stop off. 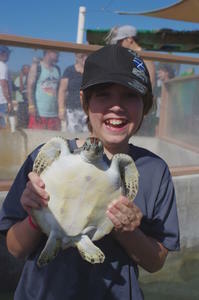 The jury is still out on whether Robert gets to wear his Hell Yeah! tee shirt to school. 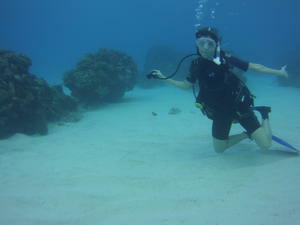 Sarah had arranged (along with all the travel) an introduction to diving for Robert (and SCUBA refresher for us) in the afternoon. 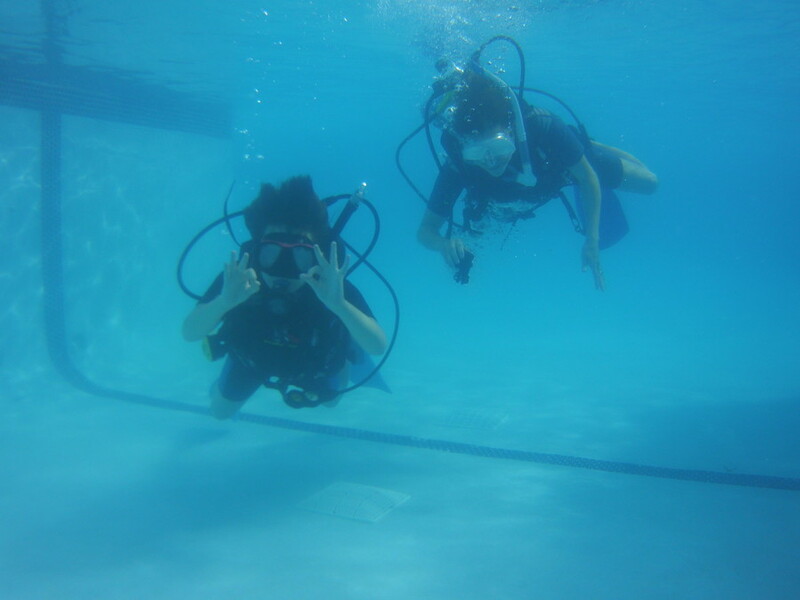 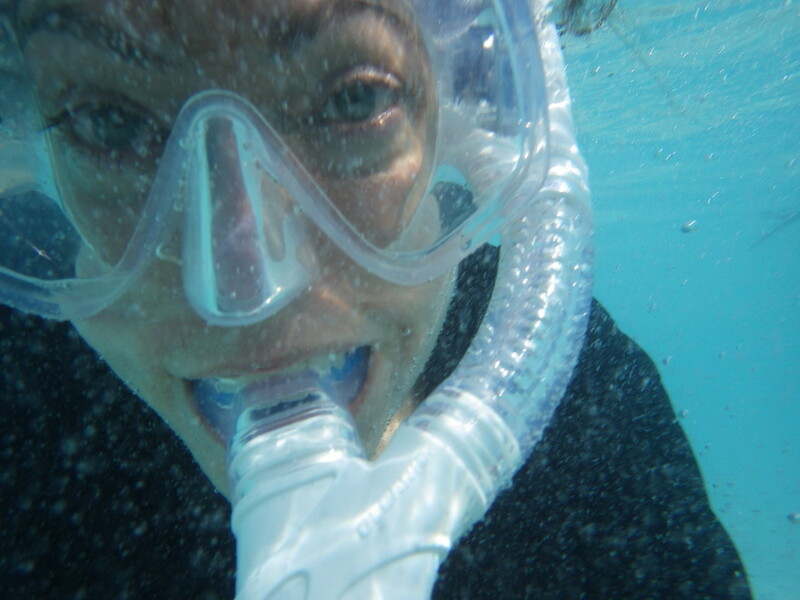 So it seemed like a good idea to check out our masks and snorkels (new for Sarah and myself, pretty new for Robert). 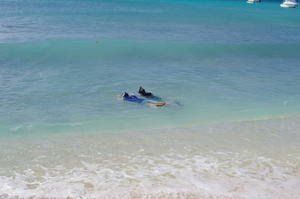 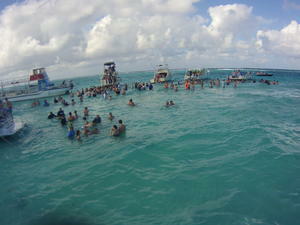 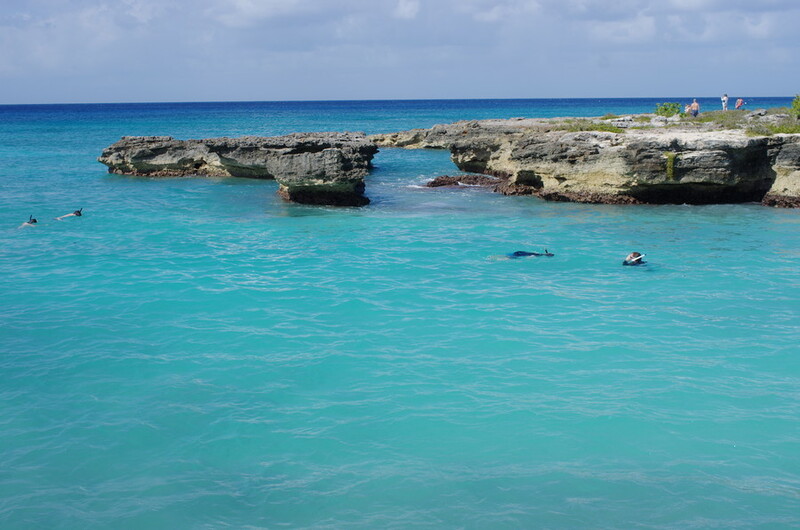 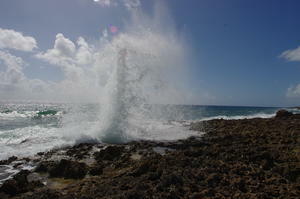 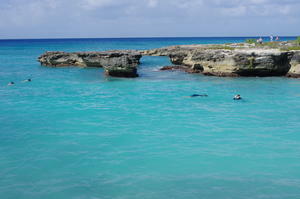 We stopped by one of the many public access spots on Seven Mile Beach and jumped into the water. 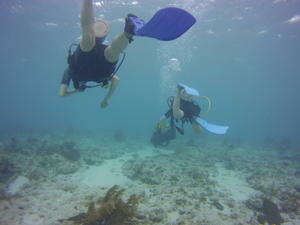 Masks and snorkels passed muster so we met up with Glen and headed to the pool for a quick checkout. 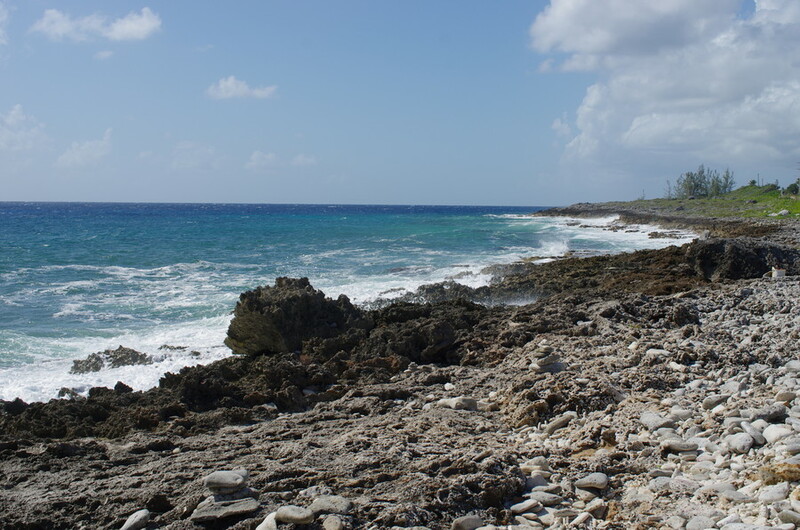 And when that went well, Glen took us to the ominous sounding Cemetary Beach (literally the next beach down the coast from our snorkeling stop). 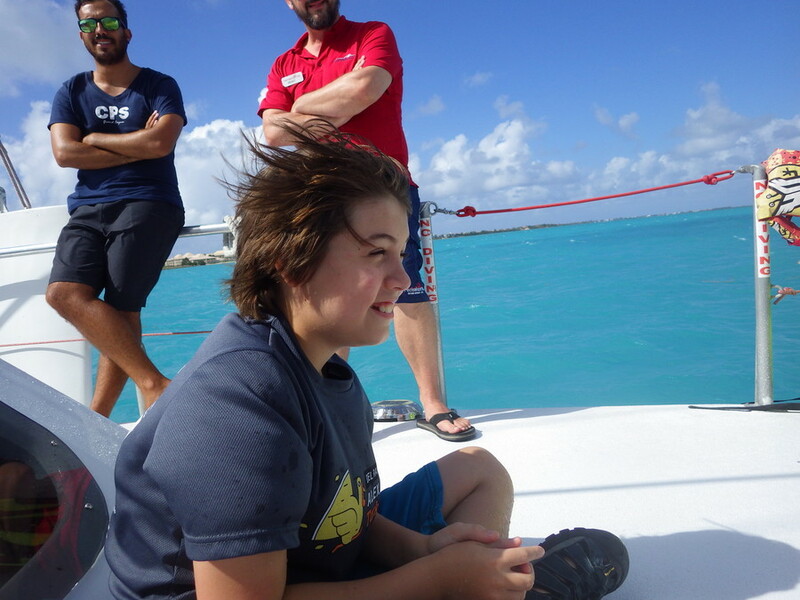 Robert had no issue with stuffiness and he had a blast on his first ocean dive! 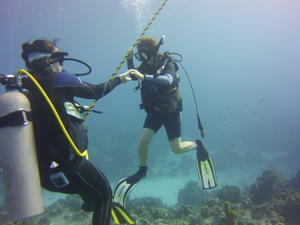 Sarah and David really enjoyed it as well. It's been over a decade since we were in the ocean. 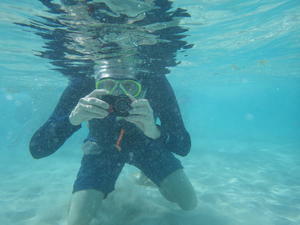 And I'm glad to say our new underwater camera worked fine to record the fun (it's handy to have a birthday just before a trip like this). 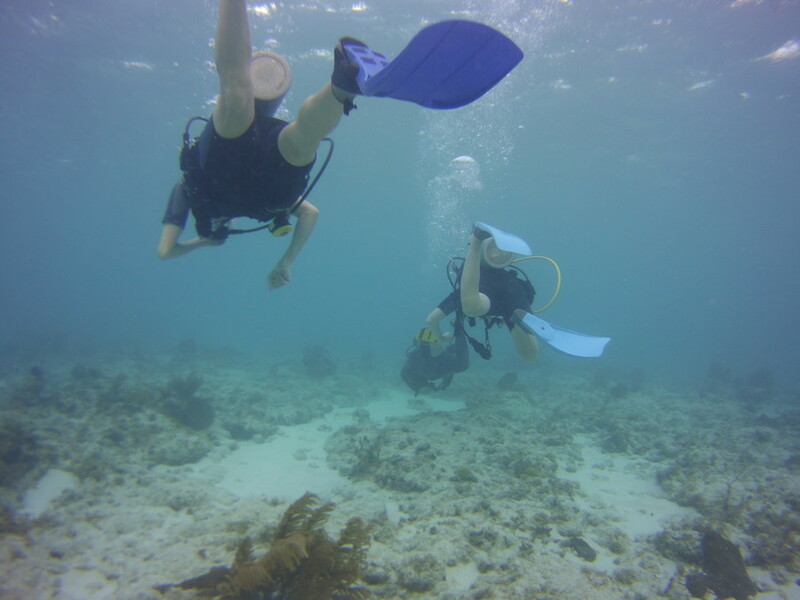 That's Glen leading Robert and Sarah around the coral just offshore (it was a shore dive, we just walked down the beach and swam out and down). 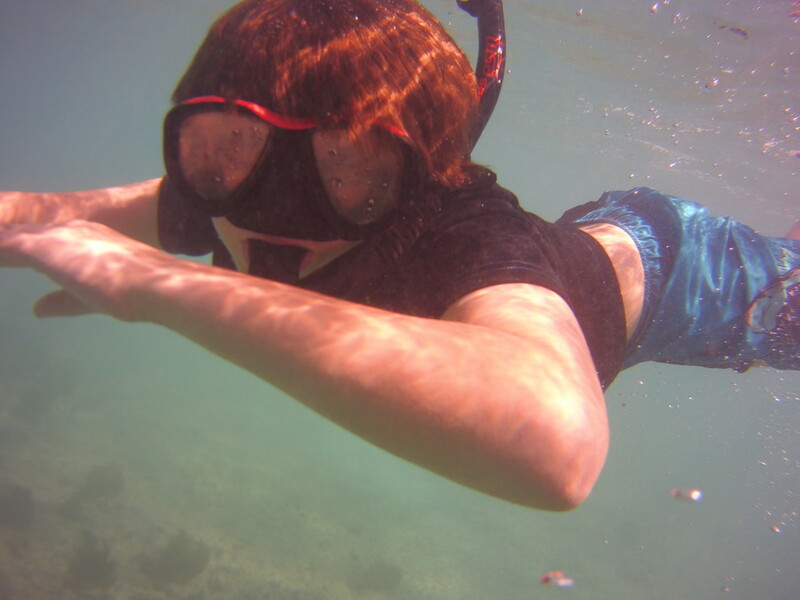 And Robert doing the superman move above the urchins as we headed back towards the beach. 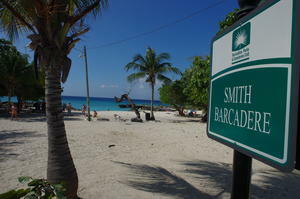 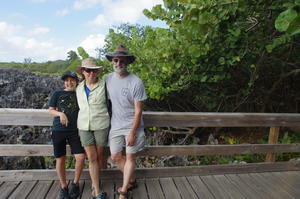 Wednesday, the next full day on the island, we headed to a beach on the southwest corner, Smith Barcadere. This was a cool spot with a small beach surrounded by ironshore and tidal pools. 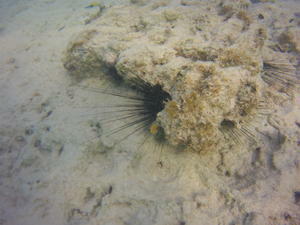 Another good spot for snorkeling and chilling on the beach. Admittedly, the visibility was not as good right on the beach as Cemetary Beach after swimming out a bit, but still, cool to dive down and look around. 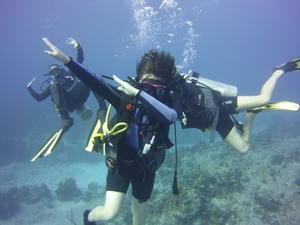 For those who don't recognize it, that is Robert and his first underwater dab. Wikipedia notes there is some controversy about who invented the dab, but to our knowledge, this is the first underwater dab of Robert's cohort. 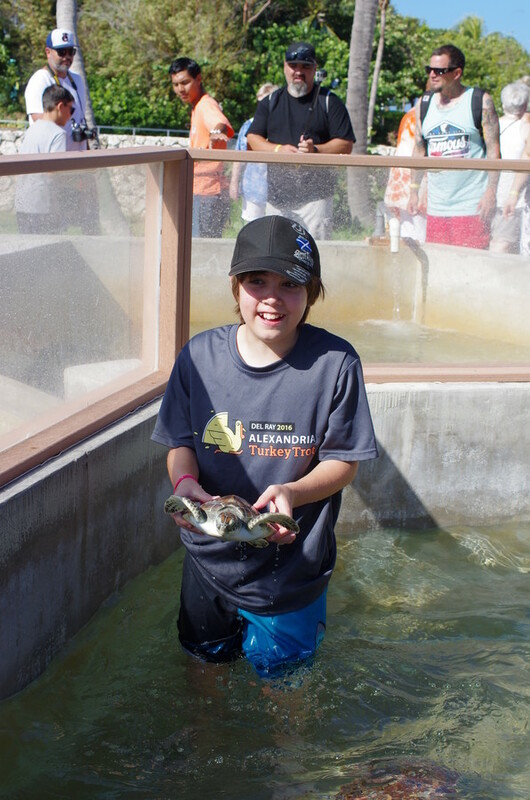 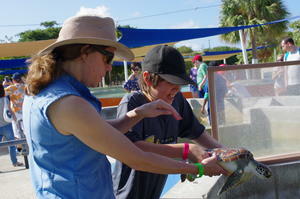 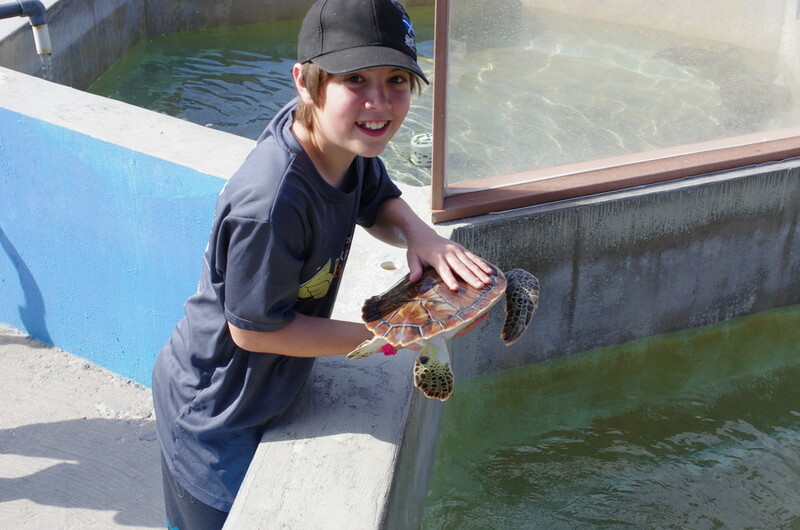 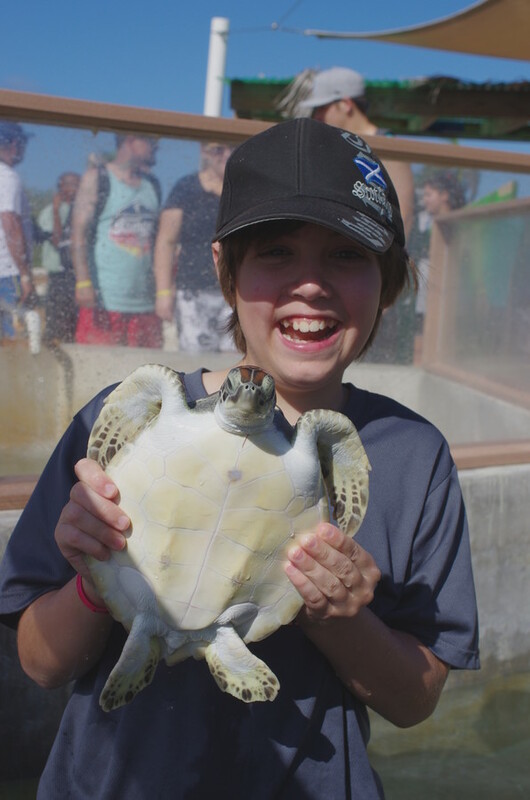 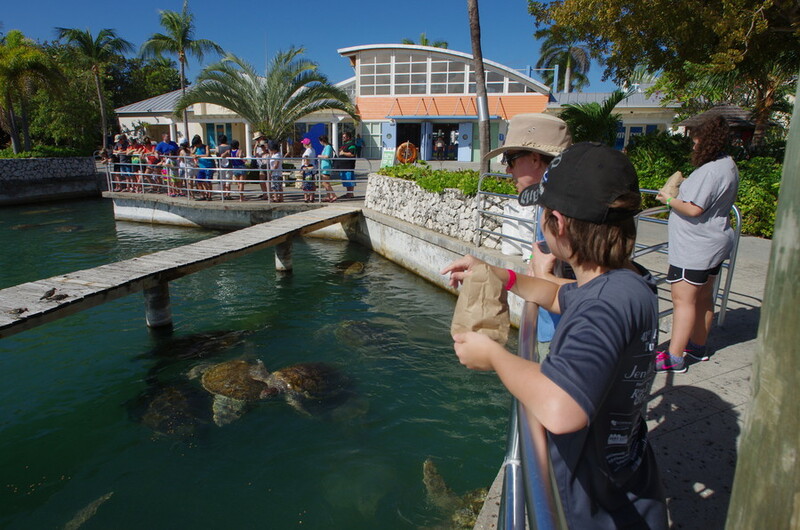 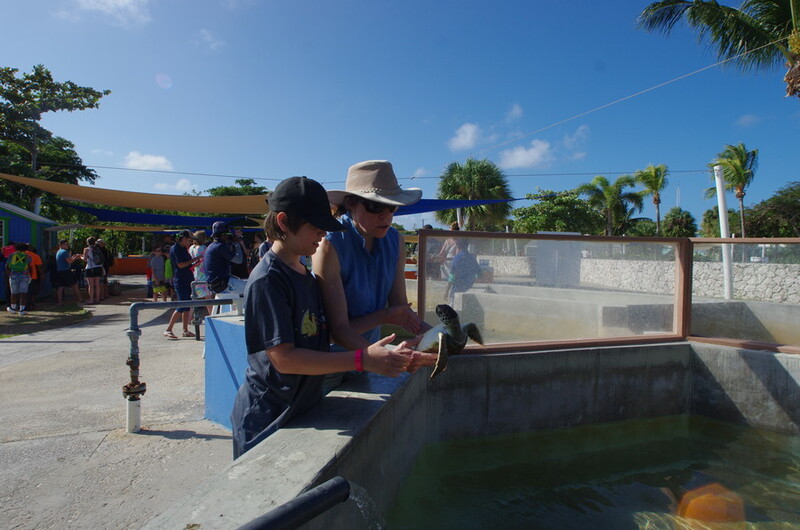 We started Thursday with a trip to the Turtle Centre (also very convenient to our condo). 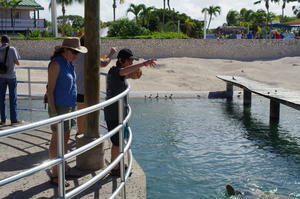 They have about 300 in this breeding pool and release thousands of yearlings into the ocean every year. 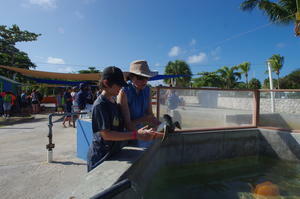 They also have "encounter" pools where you can pick up one to see how they feel. Ask Robert or Sarah to tell you about it (David was busy taking pictures). 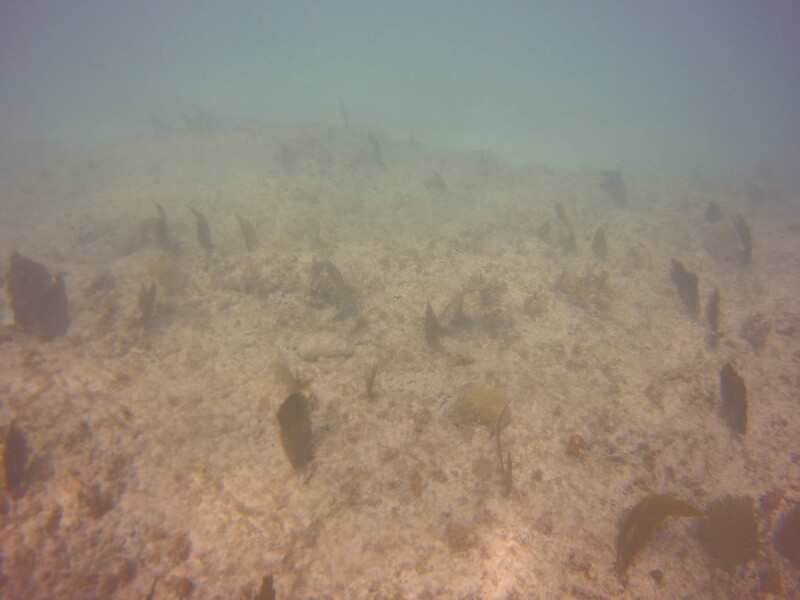 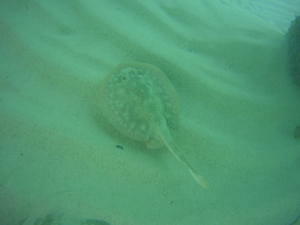 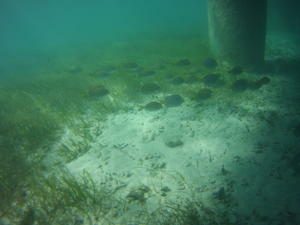 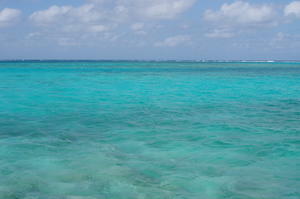 After lunch, we took a trip out to Stingray Sandbar for snorkeling. 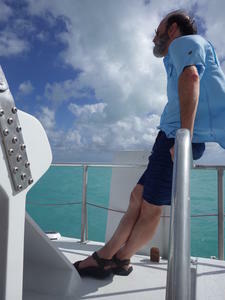 It as a nice boat trip and another beautiful day in paradise. 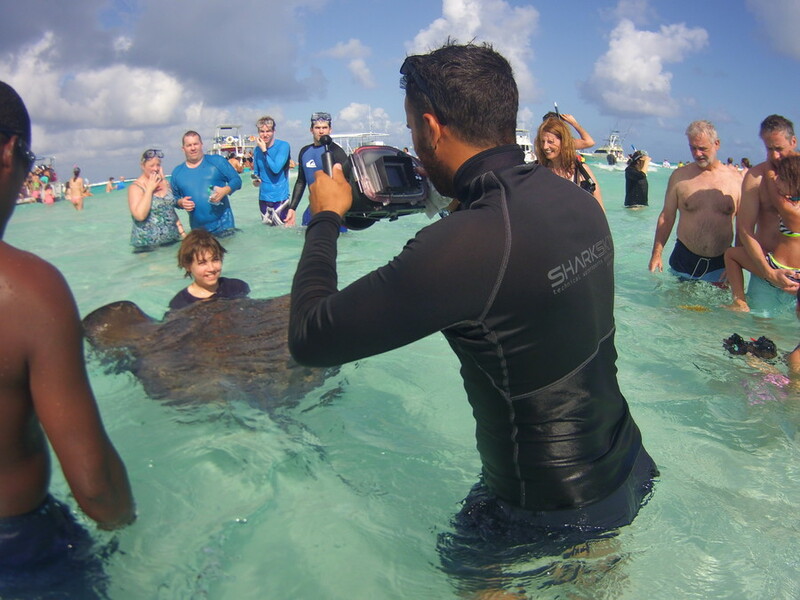 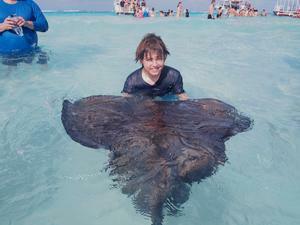 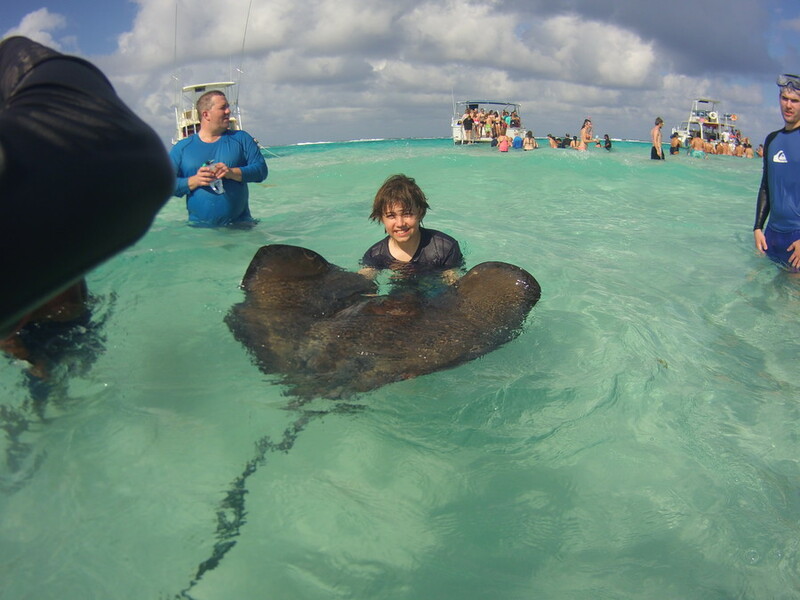 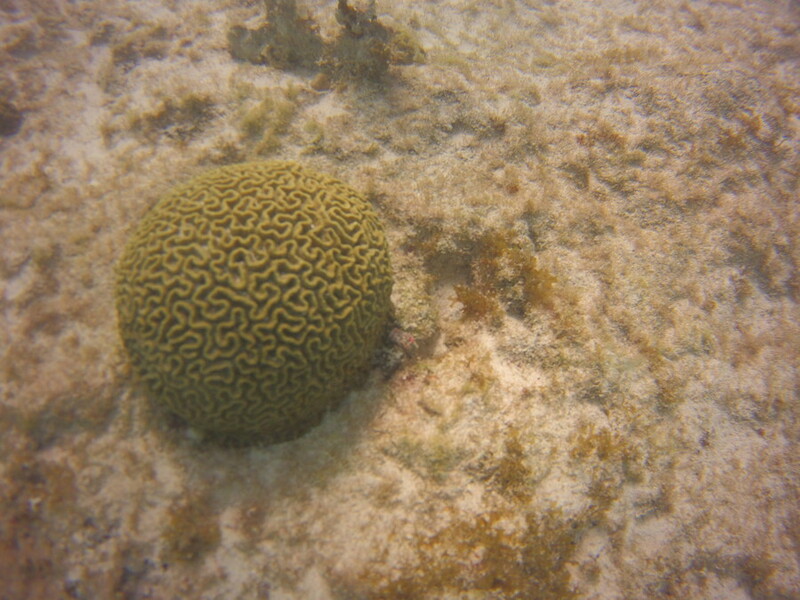 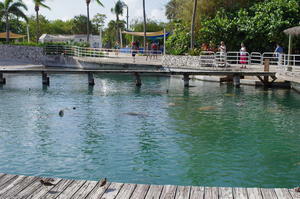 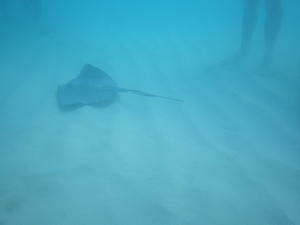 But this did not live up to our diving visit to Stingray City in 2001 (scroll towards the bottom of that page). It was crowded and with the wind, there was more current than expected. 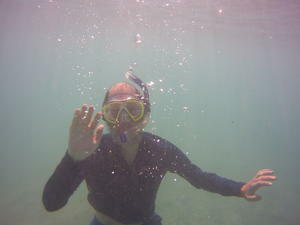 With all the boats, jet skis and tourists (like us) snokeling was not really recommended (and at two feet deep, not really needed). And the stingrays did not disappoint. 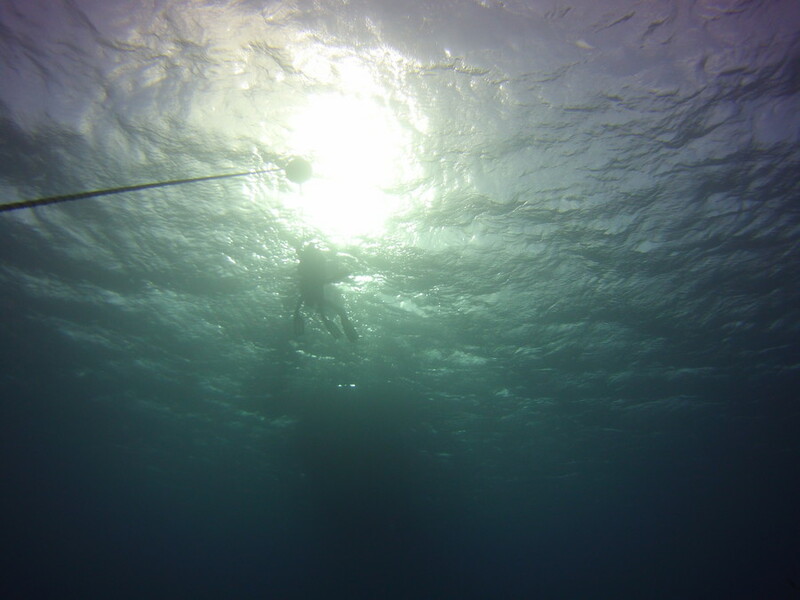 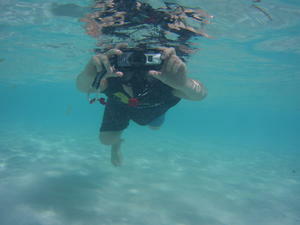 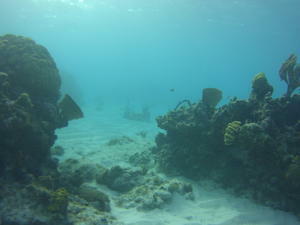 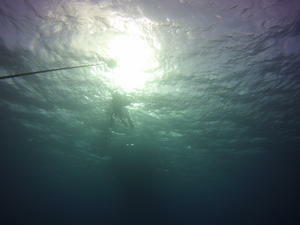 It was good place to play with dueling underwater cameras (well, underwater vs. waterproof). 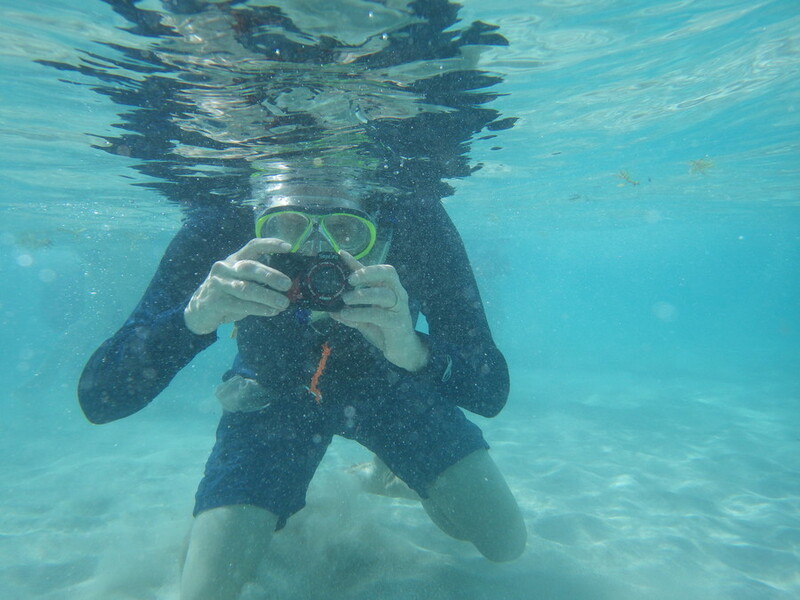 And then there was Zaky and his underwater kit; David decided to support the photographer and purchase his photos since the ray wrangling was part of his efforts. 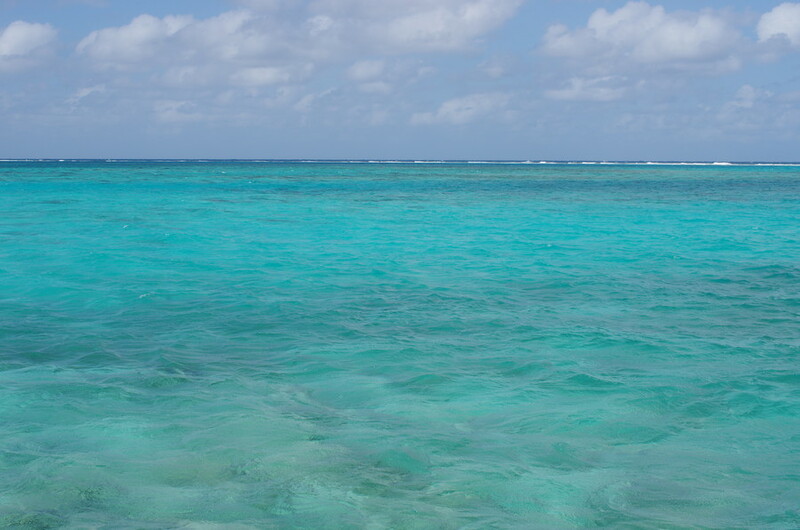 The water color in his photos is more true to life. The word on the island is you get seven years of good luck for kissing a stingray. Robert should set through high school now. 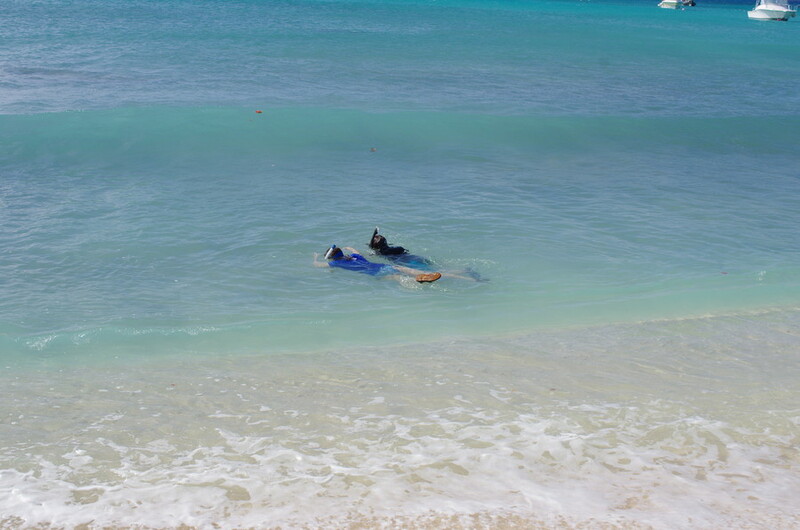 They took the boat to starfish point (rather than the snorkeling reef becuase of the wind and current) before sailing back across the bay. 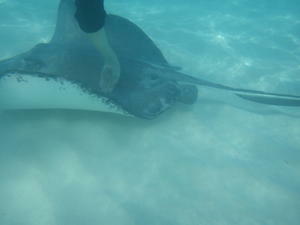 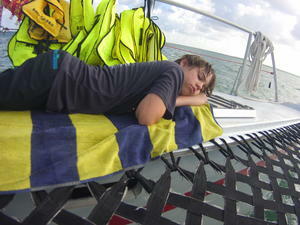 It was, as noted, a nice trip (holding a stringray can be tiring). Then we drove all the way around the island to Rum Point, a very calm beach on eastern side of the bay. (Actually not far from Starfish Point.) 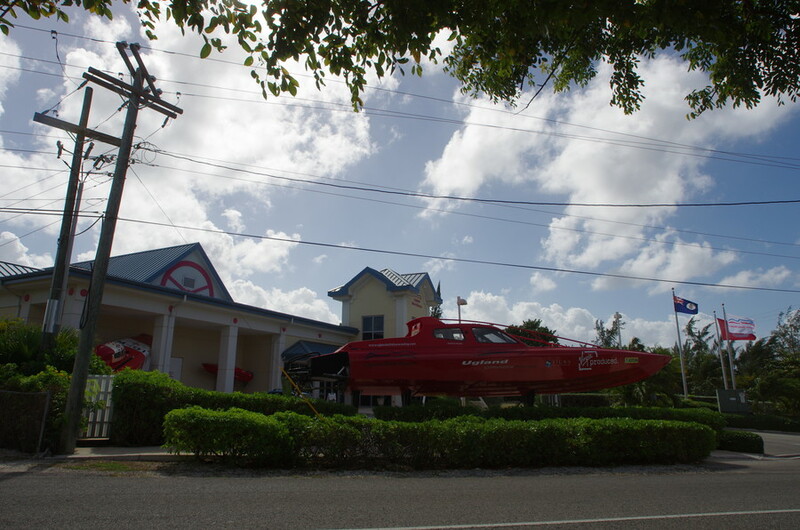 On the drive, Robert was reading up on the location in the Explore Cayman magazine. 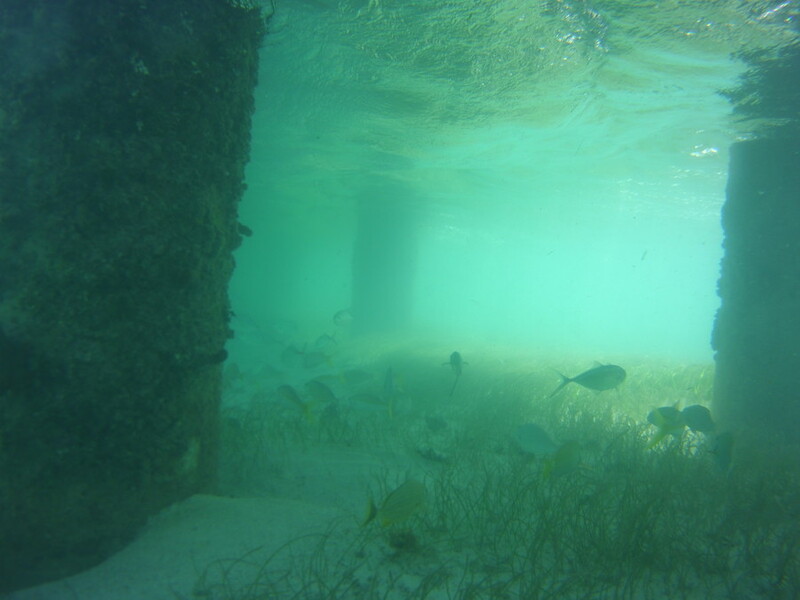 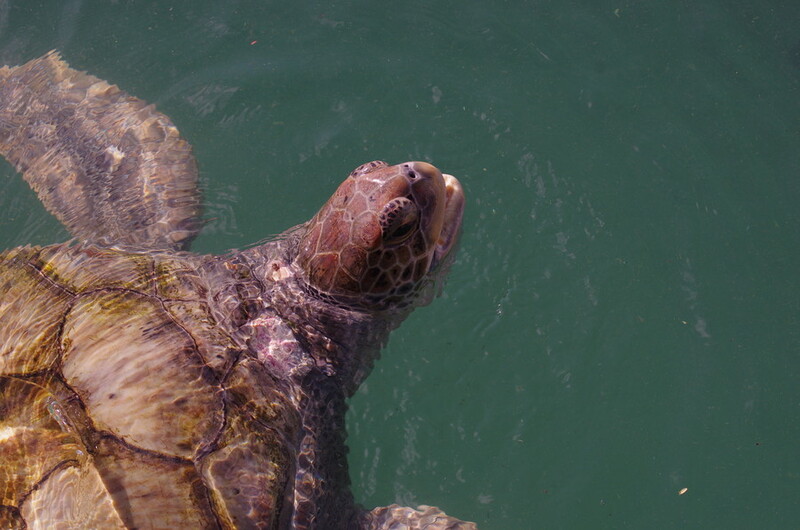 He took David on a snorkeling trip under the pier, where the magazine noted the fish like to hang out. 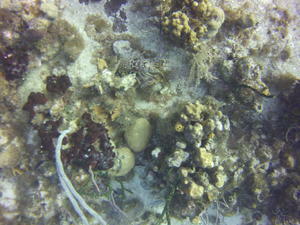 Again, it was really cool to look down and see bits out of a tropical aquirium. Hard to see in the photo below the beach fortifications is the long skinny fish they saw. 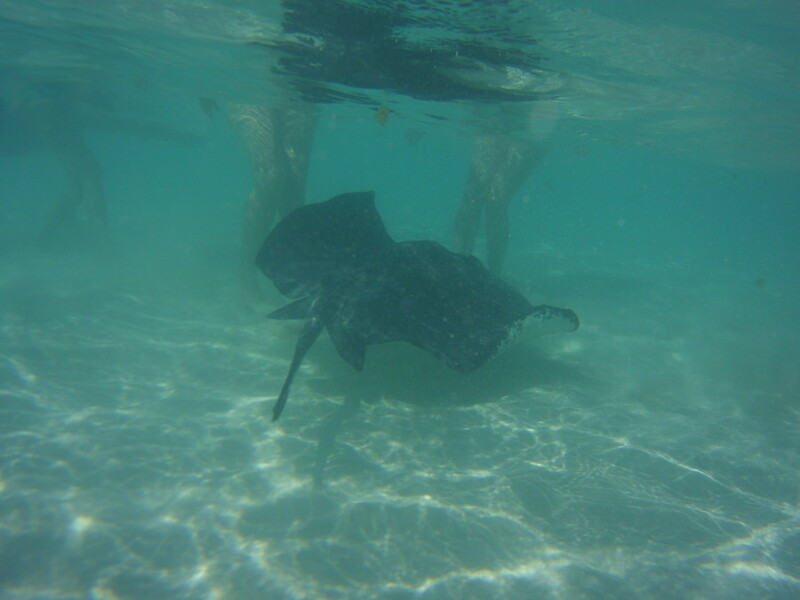 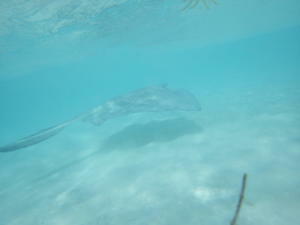 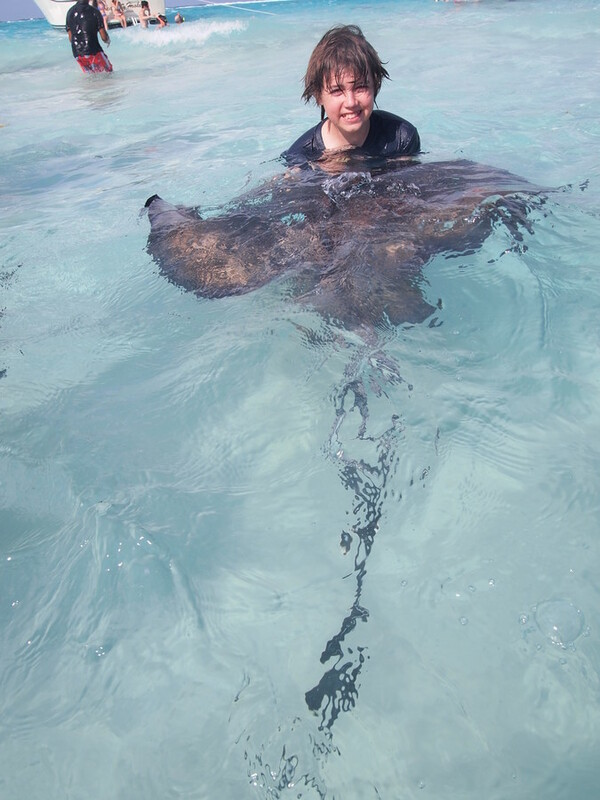 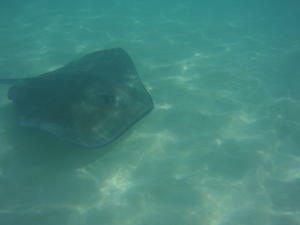 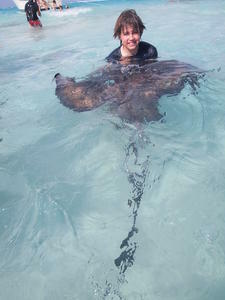 They also ran into some male rays (the guides at Stingray Sandbar noted that the females are the big, friendly ones and the males are smaller and less interested in human encounters). 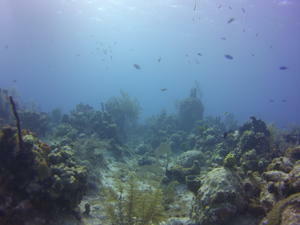 After lunch on the beach at Rum Point, we drove back for our last dive. 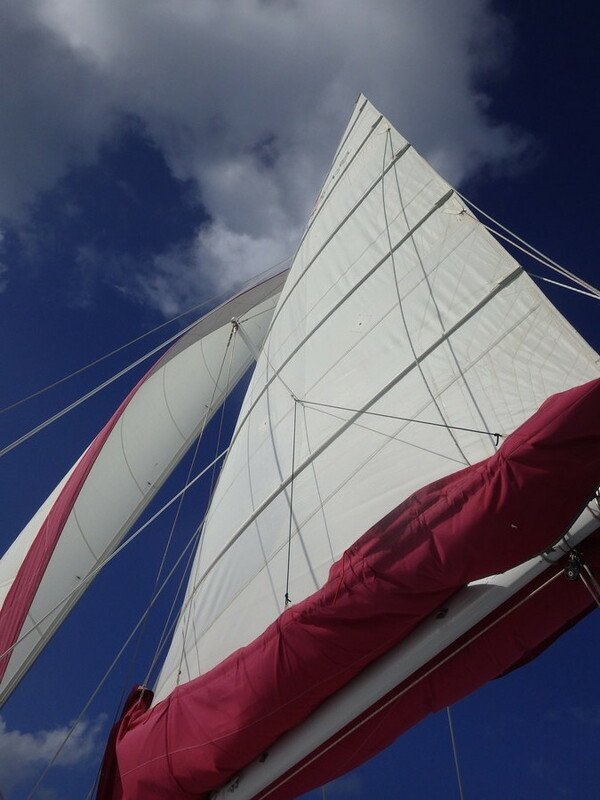 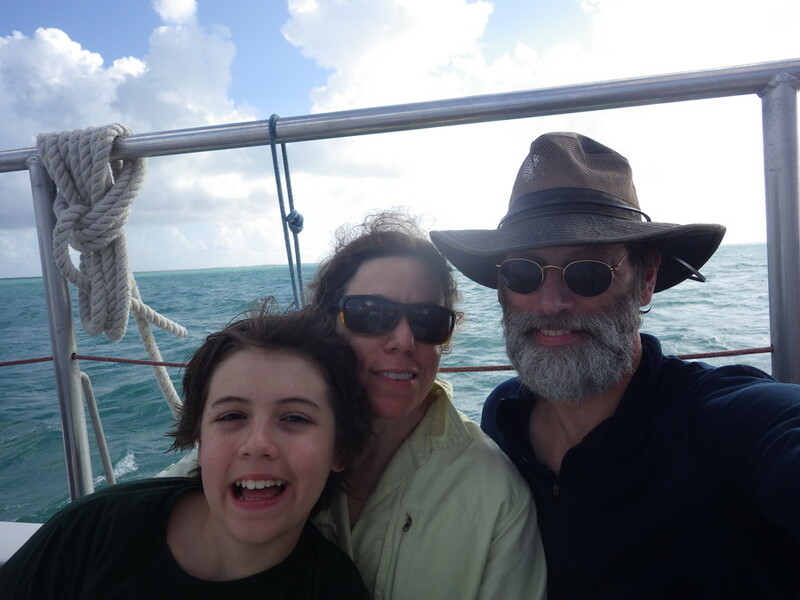 This time with Red Sail Sports at Hammerhead Hole — in the bay, just off the western shore. Amy was our guide this time (for Robert's first boat dive). 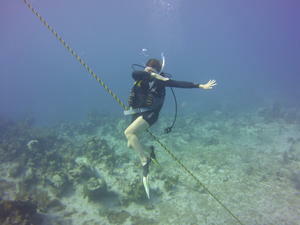 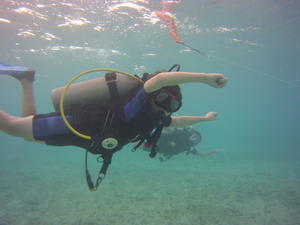 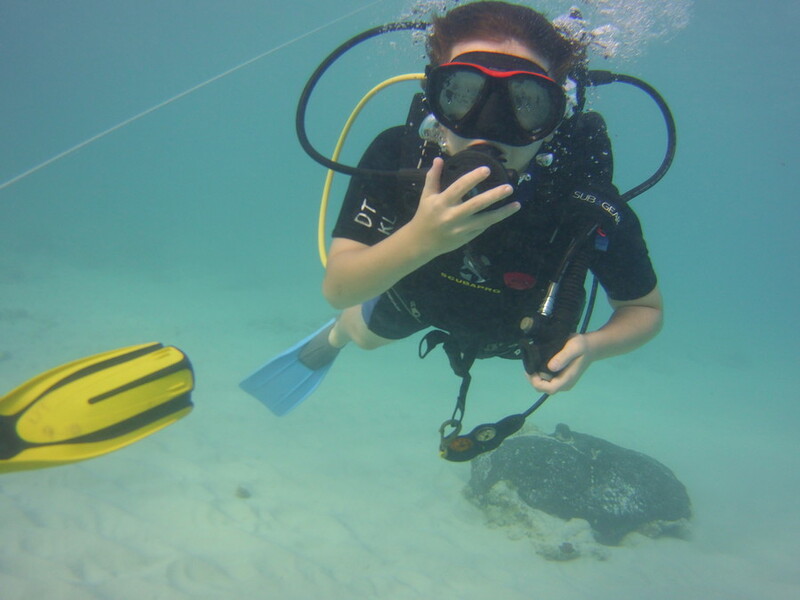 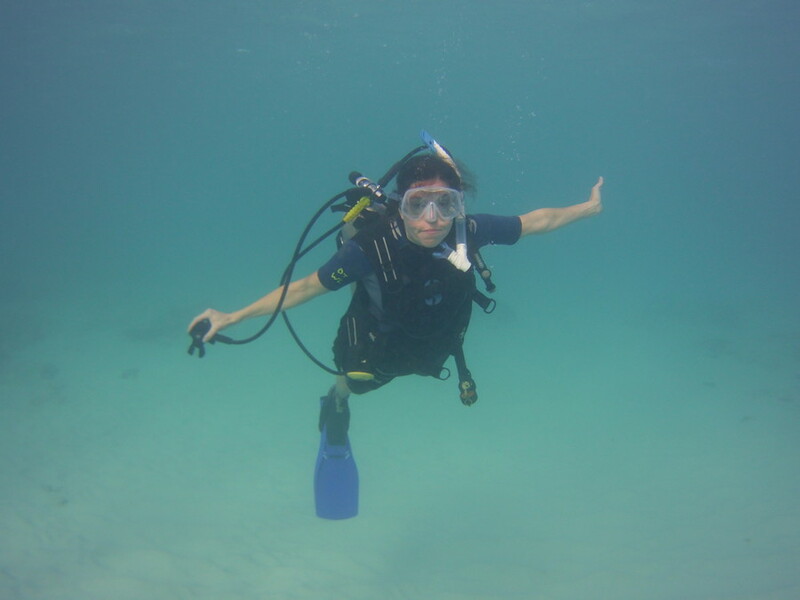 She hails from Ireland and is happy to be diving in Cayman instead. While we waited for Robert and Amy, Sarah proved she's one of the cool moms with an underwater dab of her own. 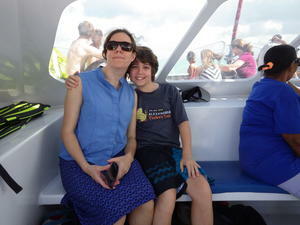 Amy was great: making sure Robert was comfortable and well looked after. 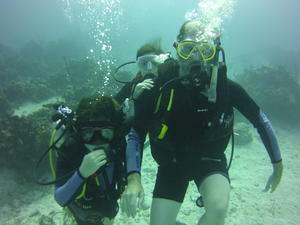 And she took this photo of the three of us at about 40 feet. 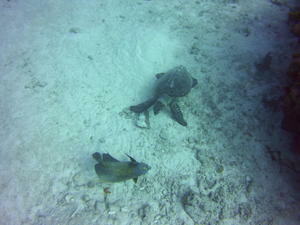 We saw this turtle and friend hanging out at the bottom. 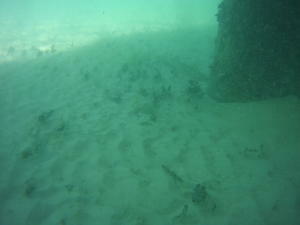 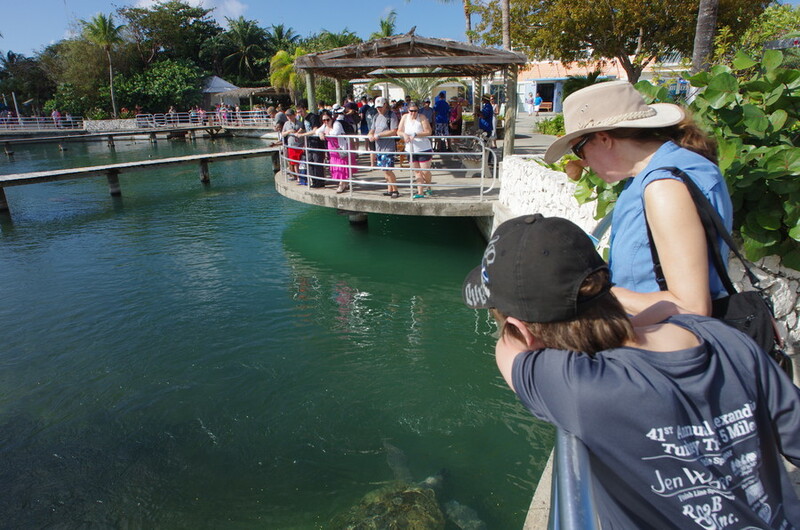 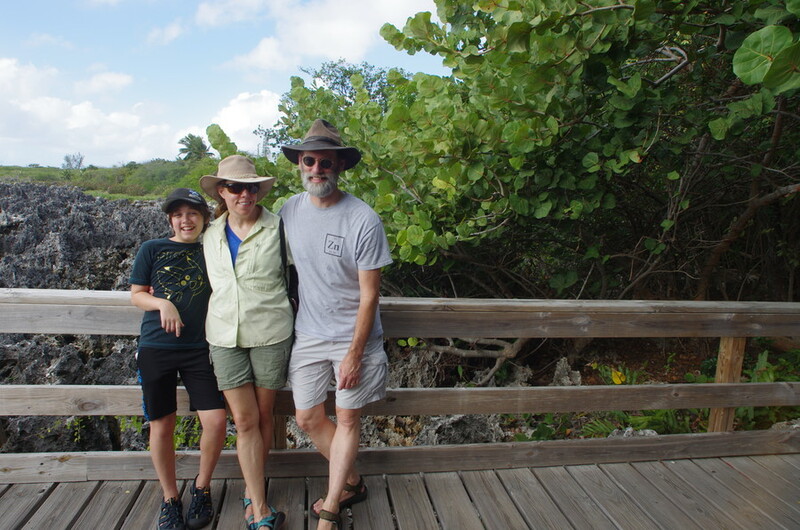 And after David had to head back up, Sarah, Robert and Amy saw a nurse shark! It was really a great way to introduce Robert to diving (but his standards are likely too high to be realistic now) and round out our break from DC. Look carefully at the picture next the dab, and you'll see a caribbean lobster that is very well camouflaged. 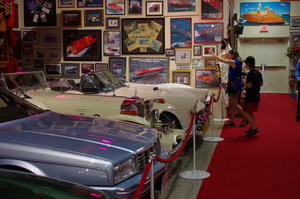 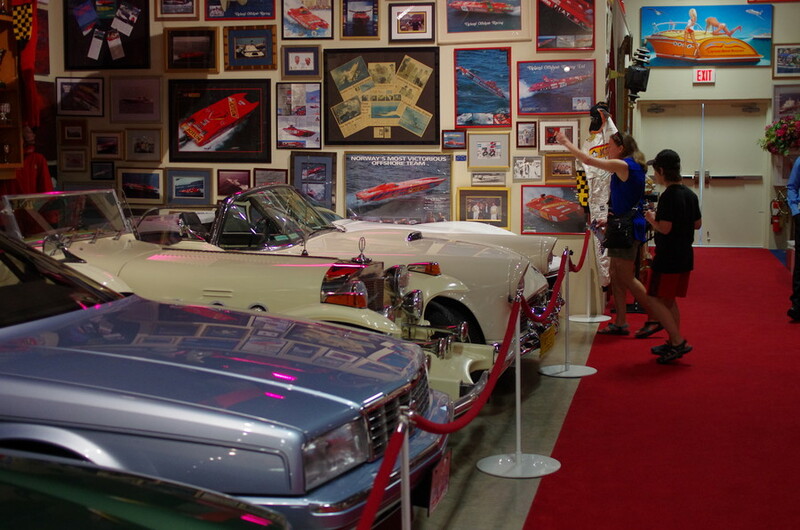 Before our (delayed) flight back, we stopped by the Motor Museum. 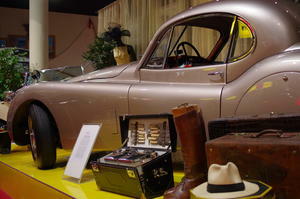 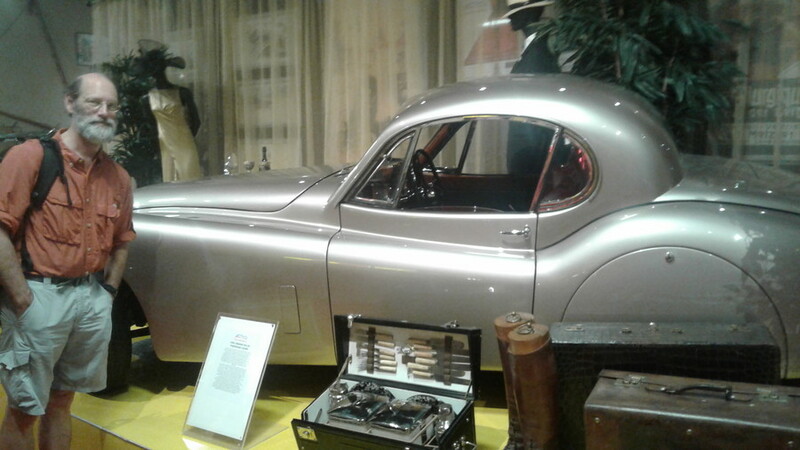 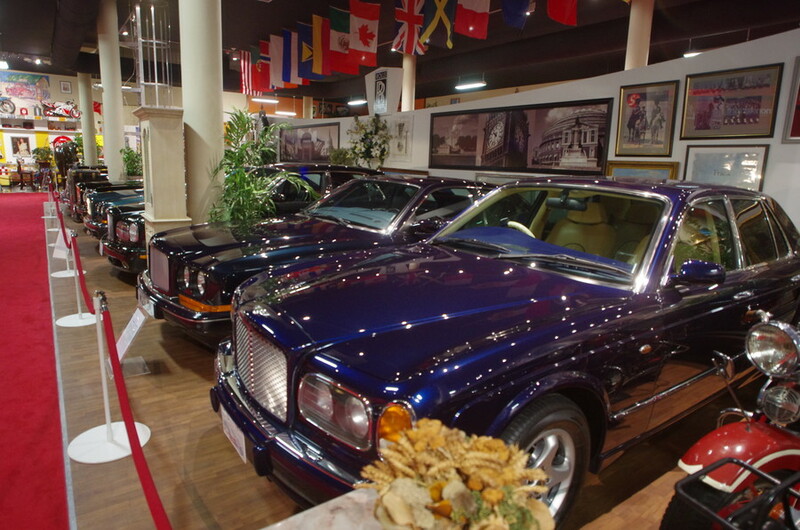 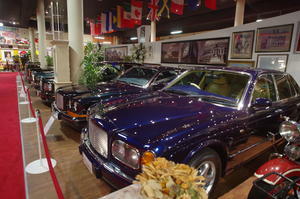 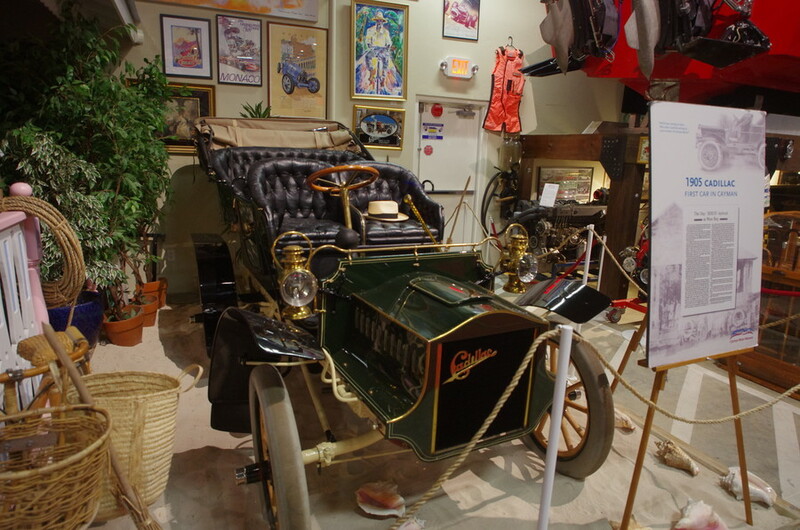 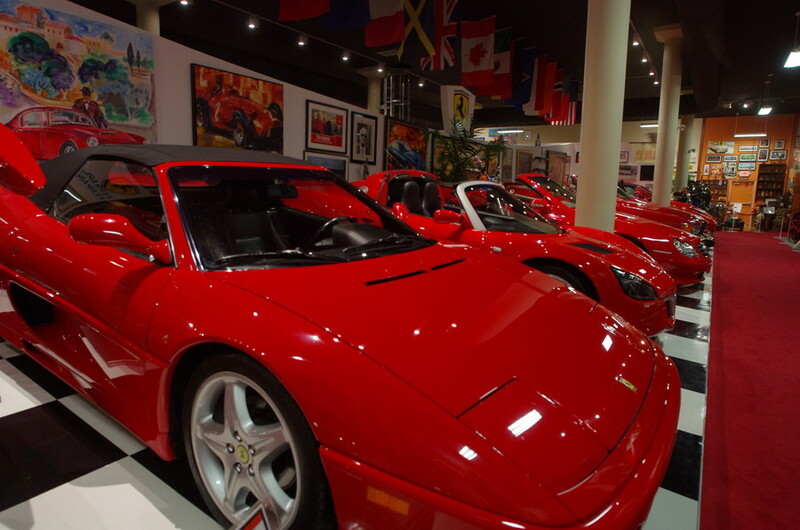 It showcases the private collection of Andreas Ugland, a shipping magnate who immigrated to Cayman from Norway. 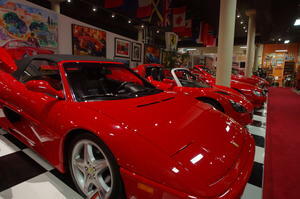 It was interesting to look at, and daydream about some of these exotic cars. 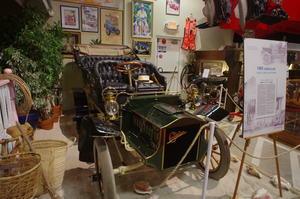 They even have the car claimed to be the first on the island (and have an article about it's first trip to West Bay). 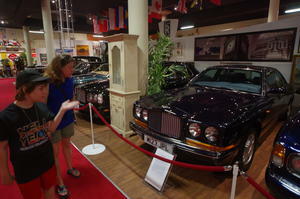 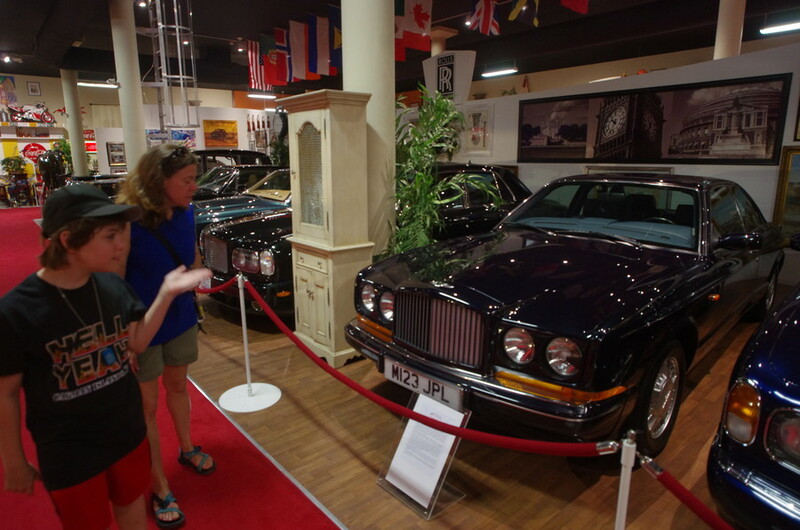 Bentleys and Rolls Royces are nice but David was wowed by the older Jaguar. 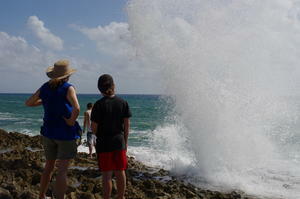 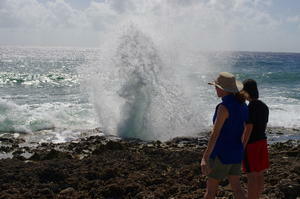 Finally, we headed to the Blowholes to check out how the waves hit a tunnel in the ironshore and shoot straight up (mostly straight). That stop may have been harder to make comfortably had our flight been on time — thank you Chicago weather for the extra couple hours. 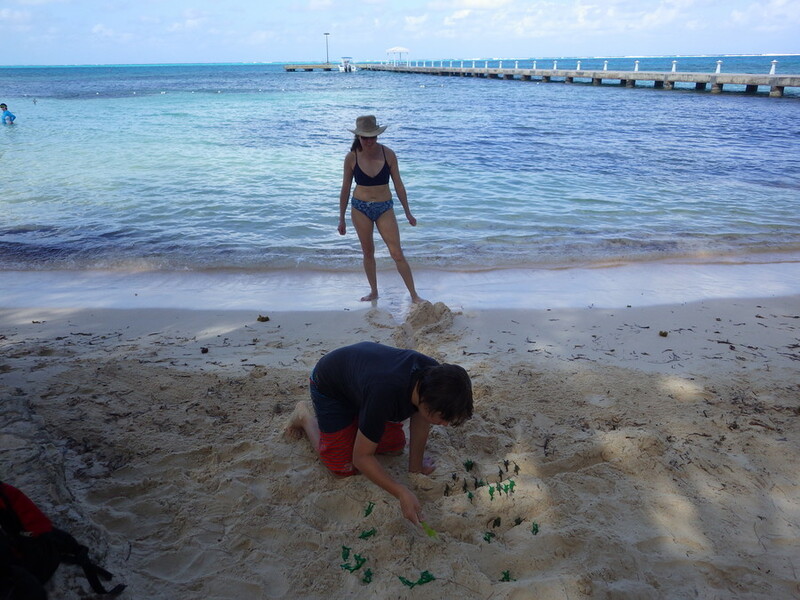 A last look at the shoreline before we headed back to DC, our kitties, Christmas tree and great Christmas dinner with friends.